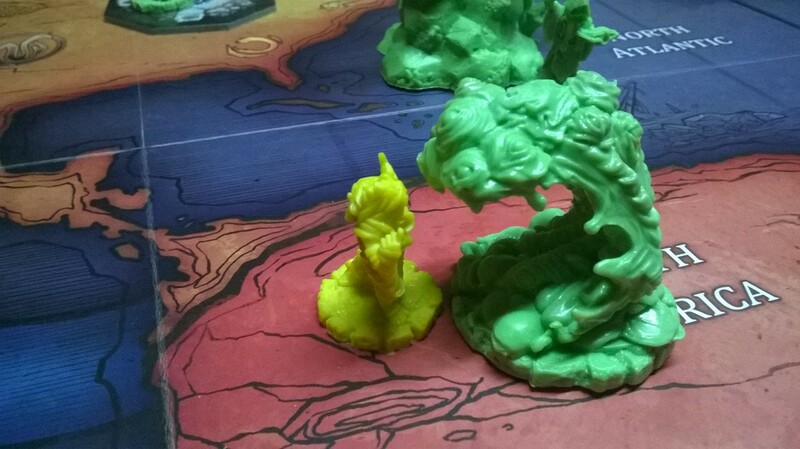 This past weekend I picked up Forbidden Island for pretty cheap at Salvation Army. Needless to say I’ve been playing it quite a bit since then. For those that don’t know: it is a cooperative game in which players race to gather four treasures and escape before the island sinks. We managed to pull it off before each time, but we were on the novice setting. I think next game I’ll bump it up a level and see how it goes. Each tile is named like in Forbidden Island but also has resources like Catan. 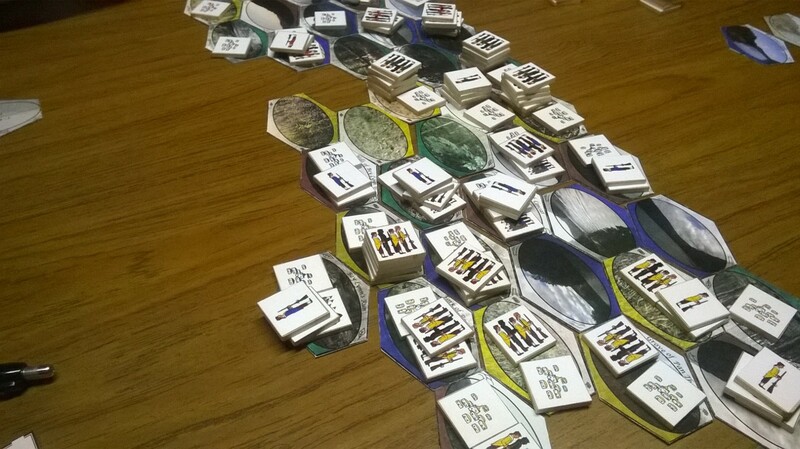 In each turn players first take their normal Catan turn – roll the dice, gather resources, trade, build. Then flip a card to flood one tile. During the build phase players have the option to “shore up” any flooded tile by paying one of any resource for each tile. These tiles must be adjacent to that players settlements, cities or roads. 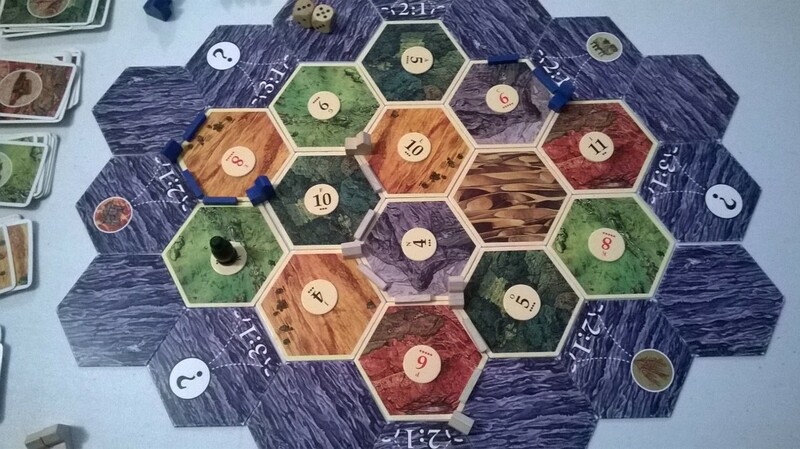 After players take their normal Catan actions (gather resources, build, etc) roll the dice again along with a third die. The third die would be a d3 with one side marked blue, if the blue side is rolled a tile is flooded. 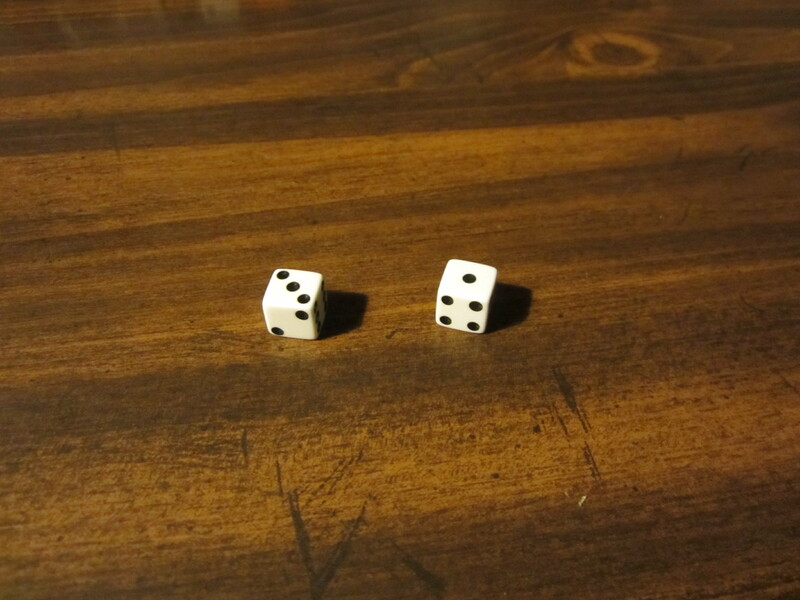 The other two dice indicates which tile gets flooded based on the number on the chit. If there is more than 1 chit with the same number the roller chooses. If all tiles of that number are flooded then the tiles start sinking into the sea. Never to return, Mwahahaha. Anyway as before, it is the rollers choice as to which one sinks. If a seven is rolled along with the blue flood indicator nothing happens – no flooding, no robber. Ex: Player 1 rolls a 4 on the two numbered dice and blue is rolled on the flood die. Player 1 chooses which “4 chit” to flood and placed a flood marker there. As above, during the build phase players have the option to “shore up” any flooded tile adjacent to that players settlements, cities or roads. In this scenario however the player must pay either a brick or a wood. 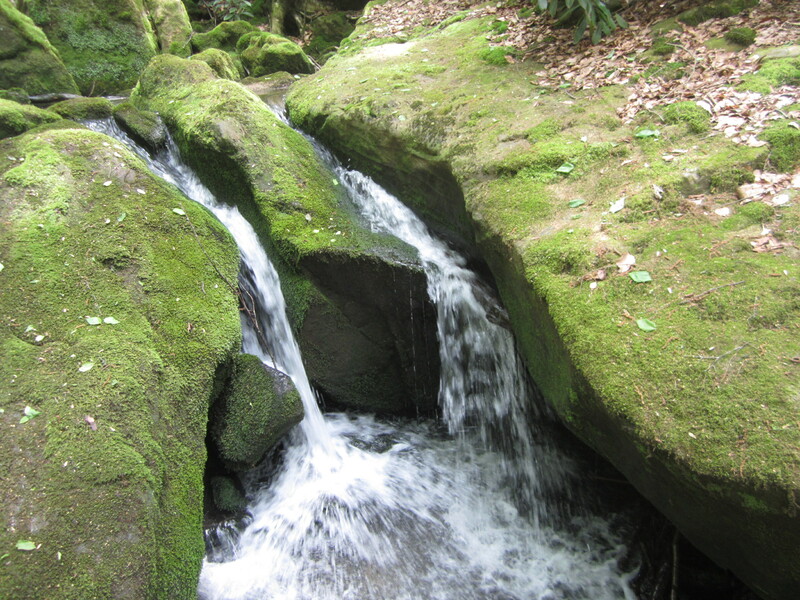 A permanent dam may be built around a tile at a cost of 2 wood, 1 brick, and 1 ore – this prevents any flooding in the future. I have not tried out either of these scenarios so I don’t know how well they would work. I would probably try the second one, it seems easier than naming each tile. I’ll give it a try some time and let you know how it turns out. 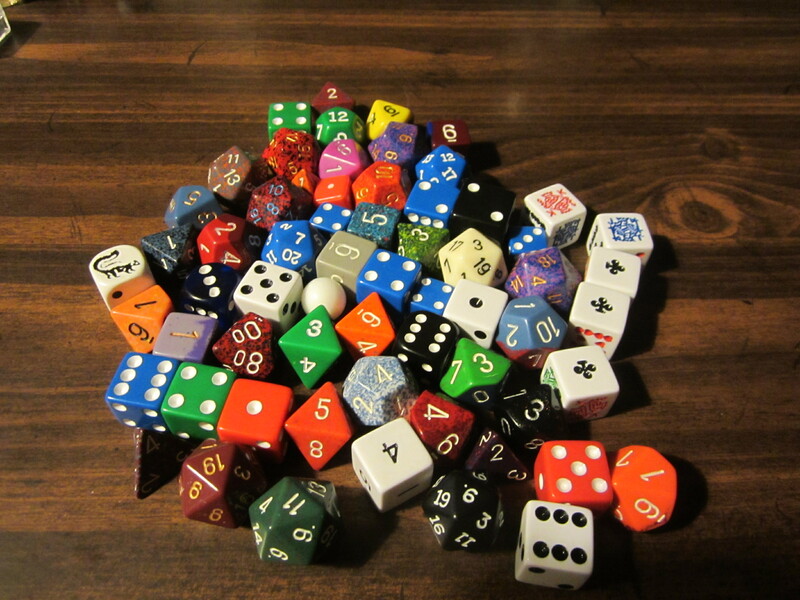 Player 2 (not you) rolls – 1 skunk die, 1d0, 3d4, 22d6, 6d8, 8d10, 5d12, 11d20, 5 poker dice, and 1 percentile die then add in 47.23 worth of modifiers. Unfair? No it’s not, it’s in the rule book pages 14, 21, 62, and a bit part from 93. Didn’t you read the rule book? Oh, it get’s better, because of what Player 2 (remember – not you) rolled, Player 1 (being you) has to give up all their gold, half their silver, and 2 copper pieces; and has to go to jail, where if they can’t pay a fee of 5 gold by their next turn they lose the game. Don’t worry though there is chance to get gold, just roll 2d6 dice and get a gold piece for every 6 you roll. Refer to page 25, section VI, paragraph 2, subsection 3, clause 4. It is all clearly stated there. Better luck next time. Here take the rule books home and study them so you’ll know which strategy to take next time. Don’t forget to thoroughly read sections 3 and 4 of volume 1 and sections 1 and 5 of volume 3, they are real game changers. And really bring to light why you made the mistakes you did. Now this was a bit of an exaggeration, I have never seen a game that bad. The only thing close that I can think of is D&D of which I have played a very limited amount. I don’t really have the time to dedicate to it. 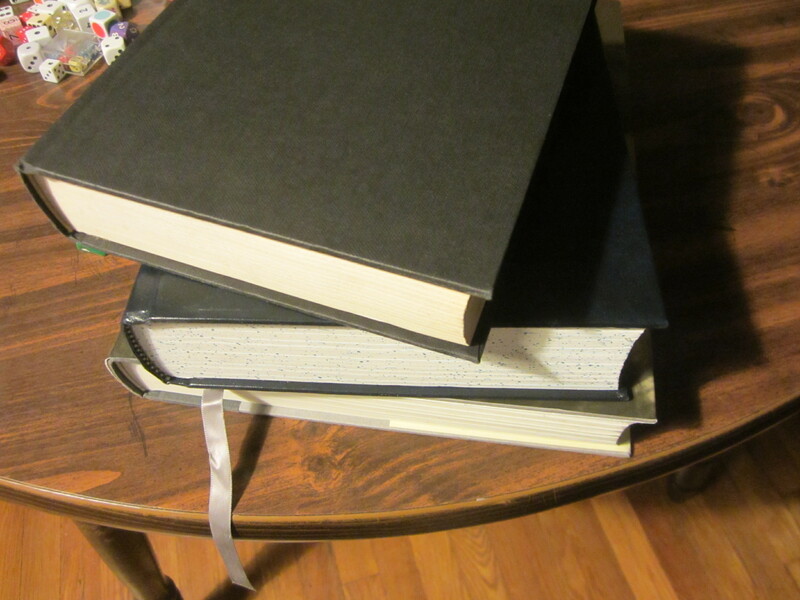 With that game you have volumes of books which can be used for rules, player handbooks, monster manuals, etc. and you have many different editions of the game, each one tweaking something and everyone will swear by a different one. Edition 3.5 versus 4.0 versus 15.26 the extended throwback edition. Okay I made up that last one but you get the point. To many rules to follow and choose from. Don’t get me wrong I would probably play another campaign if I had the time. And that brings me to another point I want to touch on quickly. Rule mongers. I understand the need to follow the rules but if it causes a half hour game shut down it is not worth it. If you are really concerned with it find the rule as the game continues and if the rule was not adhered to do one of two things. 1.) Allow the game to continue and play consistently throughout the remainder even though it’s wrong. Play the right way next time. 2.) Allow the player to change their move/ take back victory points after the fact. Even though it may skew their decisions. 3.) Allow play to continue but do it right for the rest of the game. Did I say two? Well I added one. Deal with it. Neither one of those is ideal for strict rule followers. But I say obey the spirit of the rules as well as the letter of the rules. And the spirit of the rules is to have a good time – they just set up a boundary in which to have it. That was more than a quick touch on that point. Sorry about the diatribe. To bring it to a close two questions; What’s the most complicated or easiest game you have ever played? Which do you prefer? What’s your opinion on how strictly you should follow the rules? 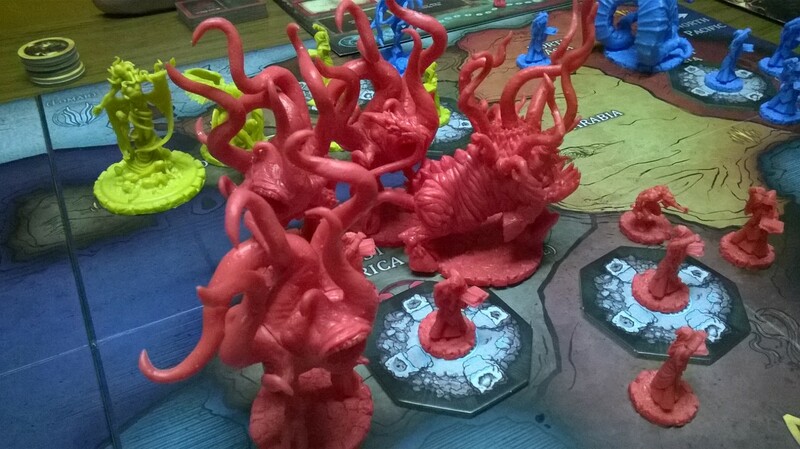 This past week at game night we got to play Cthulhu Wars. A guy from work brought it over, we got in part of a game finding ourselves having disperse the group before the game reached fruition. Victory is based on two conditions victory points and having claimed all 6 scrolls before the game ends; but I jump ahead of the wagon, let me go back and talk a little about the game before I jump straight to the end. Each player gets 1 faction placard. Each faction is different, not just a little but they are so varied it seems like it wouldn’t mesh well as a game. Everything from unit cost to scroll abilities are different. At first glance it seems broken – like one faction has a significant advantage – but that is not the case. Each faction has such outrageous abilities that they balance each other out. The game is broken nicely into phases and rounds. Each round consists of 4 phases – and I may not get their names entirely right but you’ll get the idea. In this phase you gather power from your holdings on the board. 1 power for every Acolyte Cultist and 2 power for every Gate, are the main ways of getting your power. This phase adds victory points to the point tracker. Players receive 1vp for each gate they control. This is also when you could preform the Ritual of Annihilation, in which you spend power to double those points. Be warned the ritual gets more expensive each time it is preformed so getting it earlier makes it cheaper. This phase is where players get to take their actions, each action taking a certain amount of power. There are some special abilities that allow some factions to do unique actions that cost no power. So the game goes around round after round with players expanding, attacking opponents, and gathering their spell books. Every round points are added and the first player to reach 30 points on the score tracker ends the game. At that point players add in any hidden victory points and the player with the most victory points wins the game. Contingent on if they have all 6 of their spell books. If not, the player with all six spell books and the highest score wins the game. 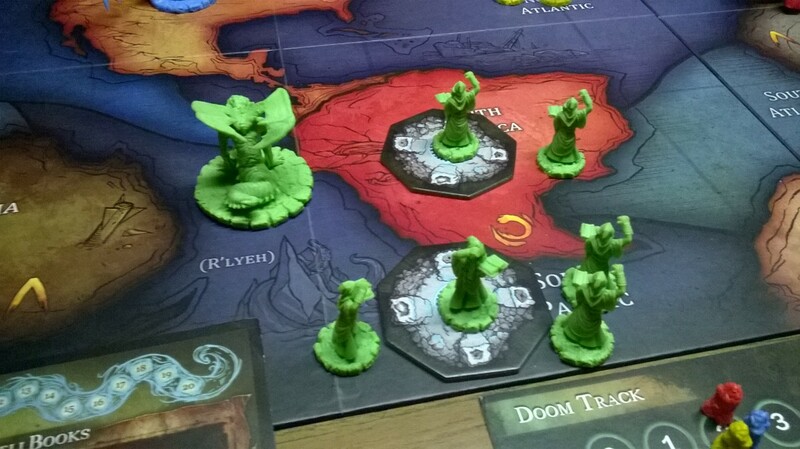 Cthulhu Wars involves a lot of reading each factions abilities and figuring out which strategy would work best for that particular one. Each one varies so game play would depend on which one you had. 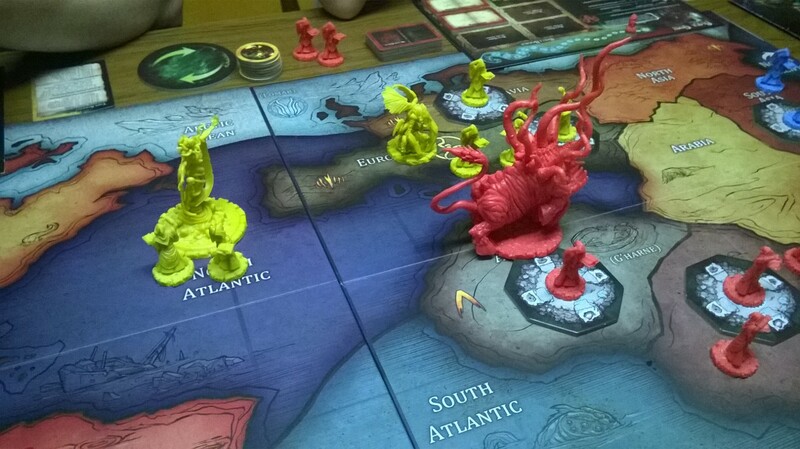 I had The Great Cthulhu and in hind sight I should have focused more on claiming ocean territories and smashing opponents. Oh well something to remember for next time. Like I said at the beginning we weren’t able to finish the game so I can’t give a full picture of the game. But we played long enough for me to say that I thoroughly enjoyed the game and would play again at the next opportunity. But, who won? I’m glad you asked. No one. That’s the short answer. No one got thirty points to end the game and no one had all 6 of their spell books. But of all the non winners I had the most points. By one. P.S. – Here are some pictures of our game. I really liked the miniatures, very large and very detailed. We managed to get in 1 game for Loot and 3 games of Dominion. It was good to get in a bunch of shorter games. Don’t get me wrong, I like a good long game, Twilight Imperium, Catan with all the expansions, Carcassonne the same way. But there is something nice about quicker games that allow more than one winner for the night. I won the first game we played. WHAT!!!?? you ask. Yes. Yes I did manage to loot the most merchant ships. It’s a fun quick game, easy to learn. Defiantly a good filler game. Then we broke out Dominion, no expansions this time. And the three games filled out the night quite nicely. The first two games were very skewed as far as card values go. In the first game we had no cards costing more that 4 coin, which made for big decks. I don’t remember the final score but it was up there, I don’t think anyone scored under 30vp during that game. The second game was just the opposite. All the big value cards were out, nothing cheaper than 4 coin. So it was pretty much guaranteed that no one could buy anything during one of their first two turns. (We play with a house rule that doesn’t allow you to buy a treasure or vp card unless you have played an action that turn. Otherwise no actions would be bought.) The Mine was out during that game and my normal strategy is to get a couple of those to upgrade my copper to silver to gold. 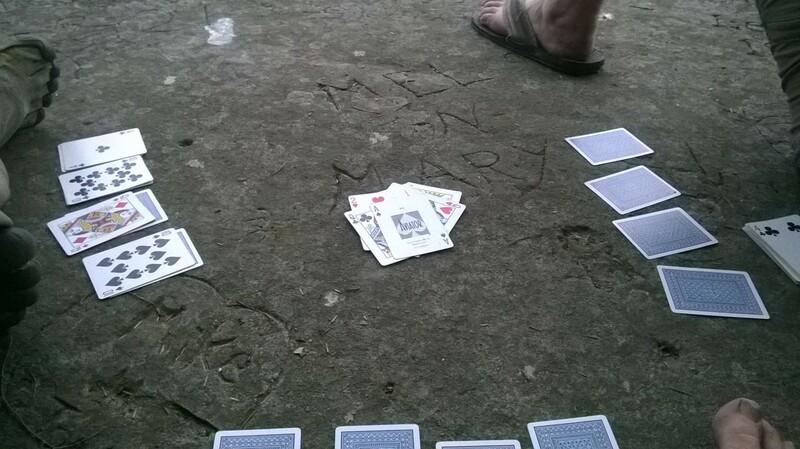 But the Thief was also mucking about and with no Moat available I forewent that and tried other avenues. I bought 2 or 3 Witches and was handing out Curses every other turn or so. That game ended with very few vp having been bought, the winner of that game totaled 13vp. 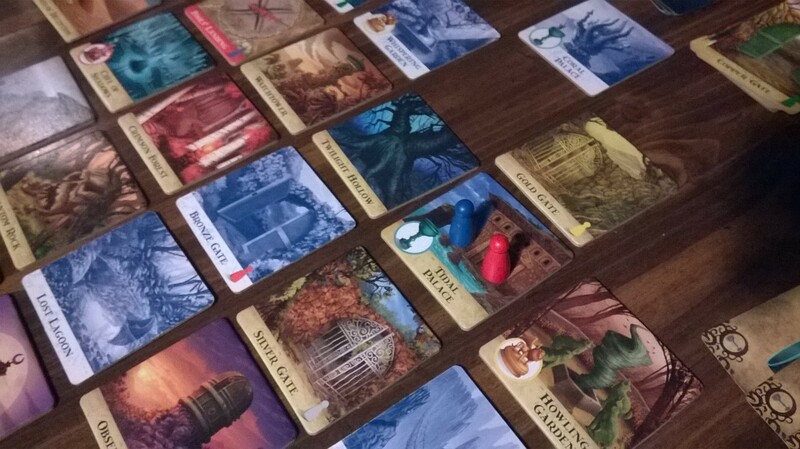 The third game had a nice balance of cards. I was able to pick up a few Bureaucratic cards and some Gardens which went a long way towards victory. I won that game too. Well, mostly… I tied for first with 31vp. That’s still winning right? I mean I did come in first, with someone else. 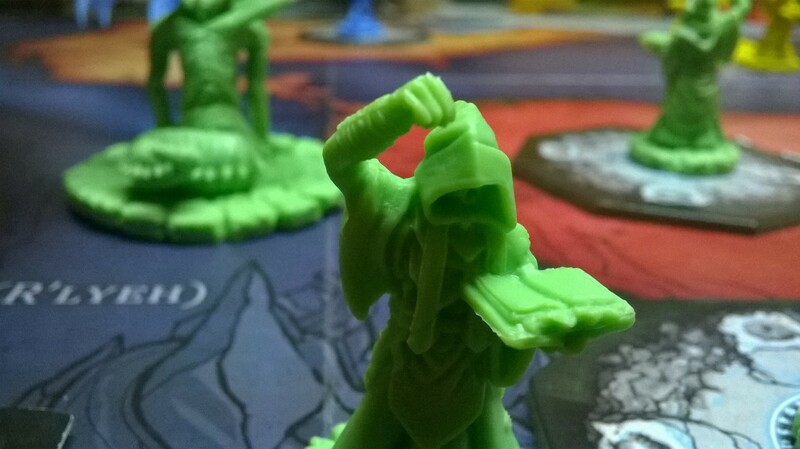 Well that was my game night this week. I also played a couple games with my kids. Two games I designed, a simple resource gathering game and an equally simple dice game. 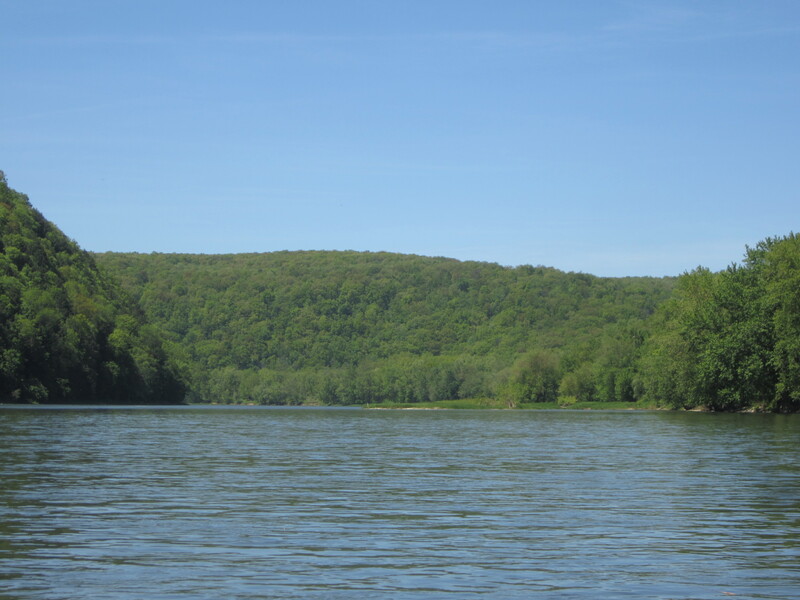 This past weekend, practically a week ago now, I took a canoe trip down the river with my brothers. We had a good time canoeing, camping, and cave crawling. Throw in some monsters and you would have a good fantasy role playing game. But we stayed well within the realms of reality on this trip. We got to our camp site late afternoon Saturday and set up camp. 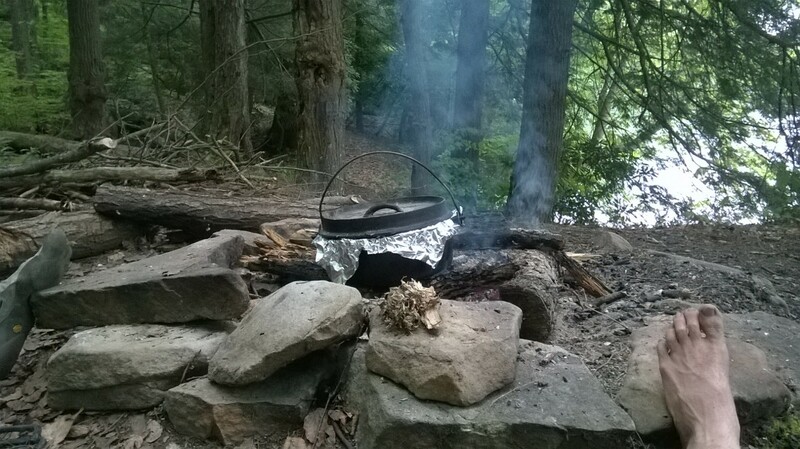 The fire started with just one match, some birch bark, and the hodgepodge of dead wood we found on the ground. Supper was a delicious Stuffed Pepper Rice. 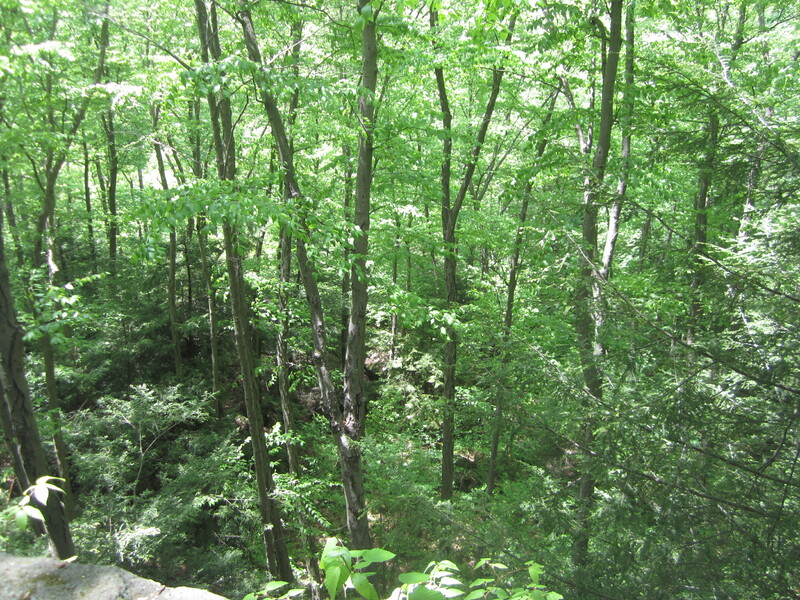 The next day we had a nice hike through the woods, hiking along a creek, heading up to the caves we had planed on visiting. 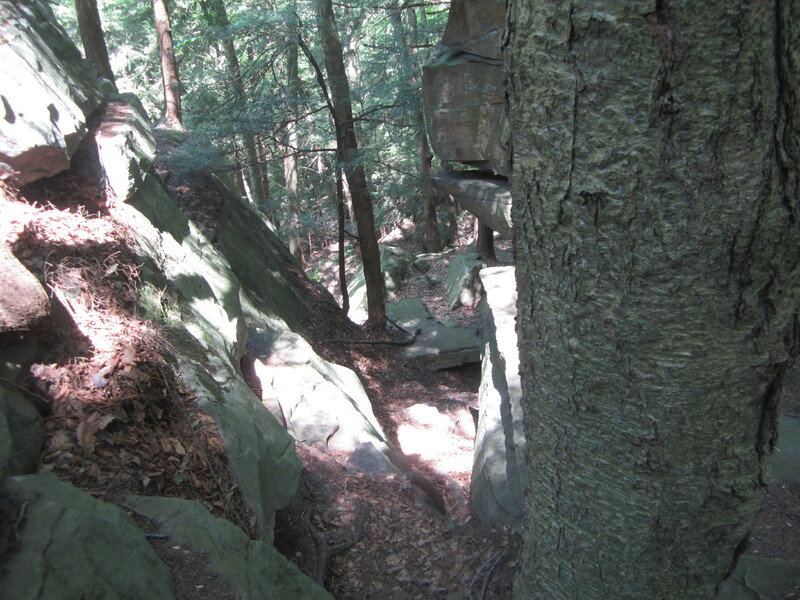 Here are a couple snapshots of the creek and the area around the caves. No shots of the caves for two reasons, my camera is not the great and neither are the caves. We did manage to play a couple small games Sunday evening. 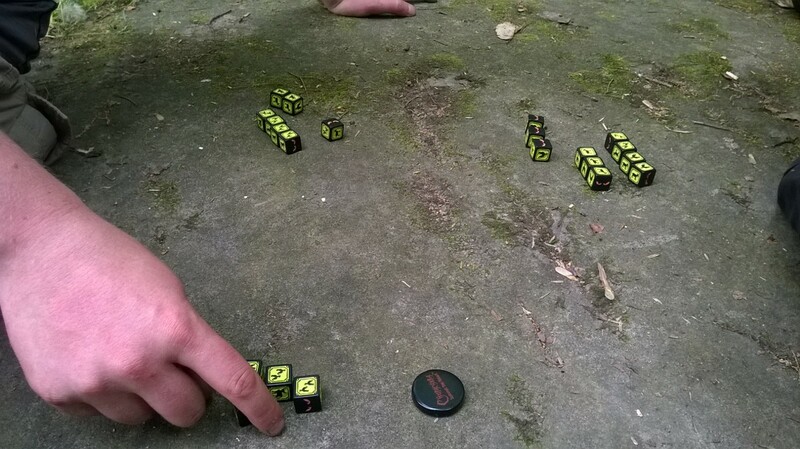 One game of Chupacabra: Survive the Night (a fun, easy to learn dice game) and two games of Palace. I didn’t win any of the games, oh well that’s life. Here’s a picture of supper cooking Sunday night. A Southwest Chicken Dinner I do believe. We eat good on these trips, I mean we have a canoe so why not get all fancy. Anyway that was some of the highlights of my trip. Not too much to speak of on the gaming side of things but we kept busy and had an enjoyable time. P.S. Stuffed Pepper Rice – quite delicious. Brown burger with diced onions, peppers and garlic; season to taste. I used garlic powder, onion powder, oregano, parsley, black pepper, fennel seeds, cumin, and salt. While burger is cooking bring 4 cups water to boil, add rice, and simmer for the allotted time or until the water is gone. I used Jasmine rice, cooked for about 15 minutes. Mix burger, sauce and rice. Heat through, serve hot. Go back for seconds and possibly thirds or have a lot for tomorrow. This week has been and is still crazy busy for me but for all the busyness I still found time to play some games here and there. So here’s a quick look at the games I’ve played this week. 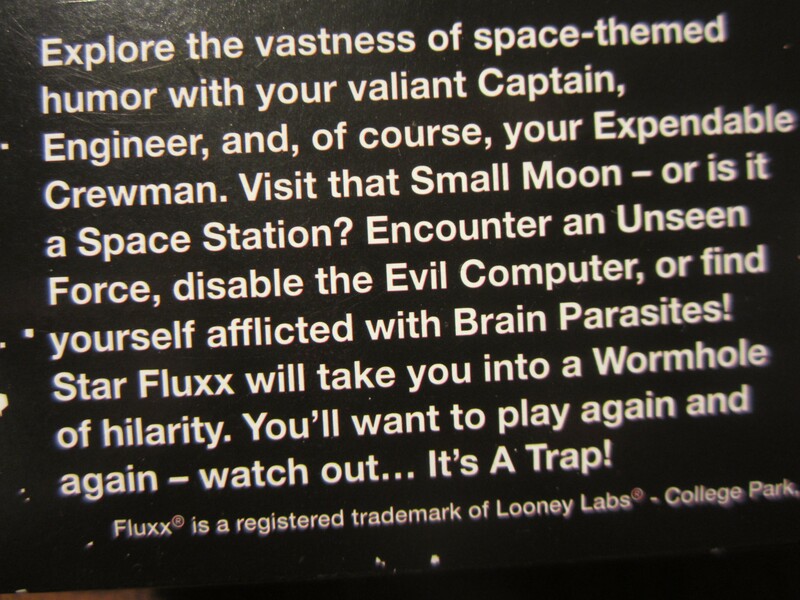 We played quite a few games of Star Fluxx – to many to tell. It was fun but I think I’m getting ready for something else. 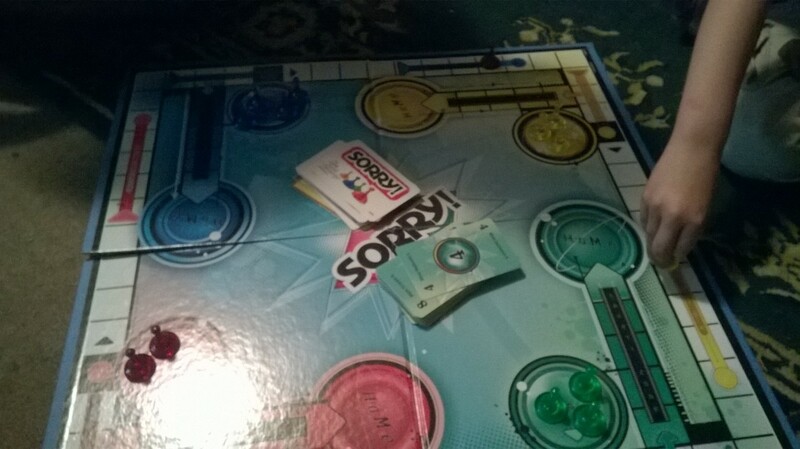 Sunday we played Sorry with the kids. They started getting antsy after about 15 minutes so we decided to quite. I had gotten the most pawns Home so I guess I won the game. My youngest just wanted to keep knocking people off the board – he thought that was great. I was able to do some more play testing on Frontier. Got some new ideas I will try to implement to see if they work. Also some ideas that could come in handy for any future additions to the game. Thursday I took Crush to work and we played a round during afternoon break. A nice way to break up the monotony of work. I managed to get a Double Down during the last round and pulled ahead but another guy beat me by 100 points on his last throw. Oh well, that’s life in the world of games. If you recall I recently, with in the past month or so, I picked up the Catan World Championship 2014 expansion. There is a little bit about it on my post From Burger to Skunk. Anyway this afternoon my wife and I got some time to play Catan with that expansion. I like the way it plays and I plan on doing a more detailed post about it when I get the chance, probably early next week. 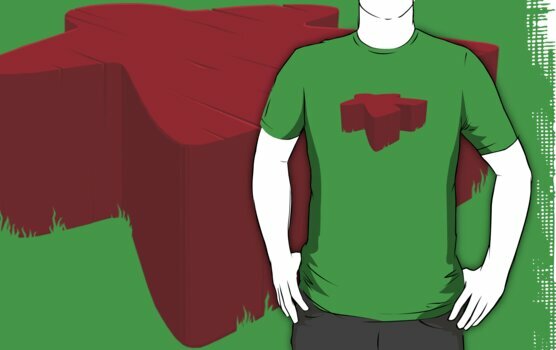 Recently I have wanted to start getting some board game themed t-shirts. So I have been looking around, not that I have the money to get any. 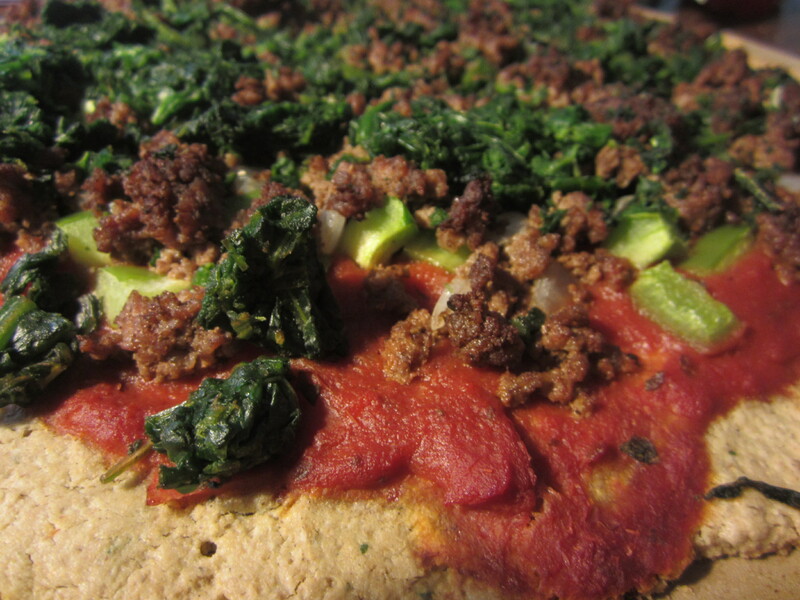 If only I could make dough of the green sort as easily and quickly as I made the pizza dough you see to the right. 15 minutes was all that took, of course it took longer to cook it. The recipe is at the end if you want to skip to that. Anyway here are some of the t-shirts I would get if I had the dough. A Settlers of Catan reference tobe sure. I’m not really a fan of any of the ones available through the Catan Store but here’s one I found at Busted Tees. This one may be obscure to the more casual gamer. 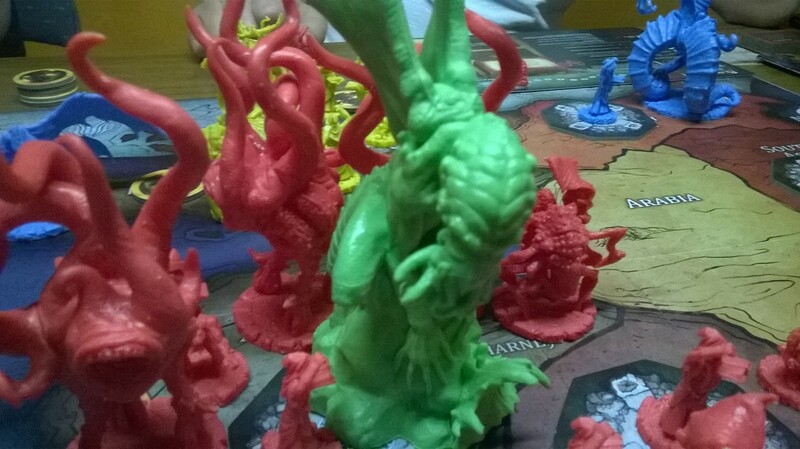 Twilight Imperium – a wonderful game that can last anywhere from 9 to 12 hours or more. Of course that might just be the group I was playing with. Just a general reference to game mechanics. A good shirt showing a farmer laying in the grass. Because… that is apparently what farmers do all day…? A nice shirt to have if I ever get the green. Well that’s enough from me. I could go on. But that would get boring for anyone but me. WAIT there’s one more! The Woot Shirt of the Day for yesterday. Saw this one late yesterday and had to get it. It was within my price range and looks cool. 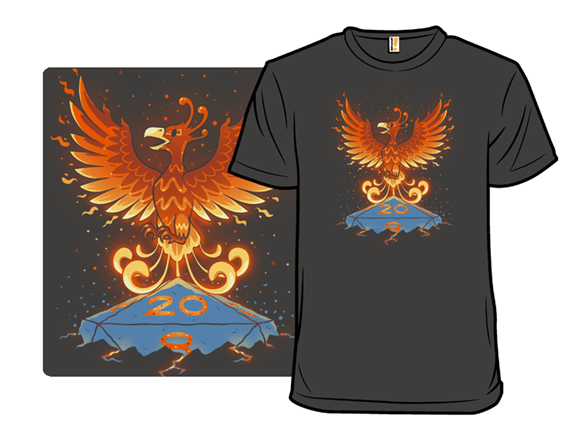 A phoenix rising on the tide of a natural 20. Anyway, that’s it for me. Until next time, enjoy the pizza. P.S. 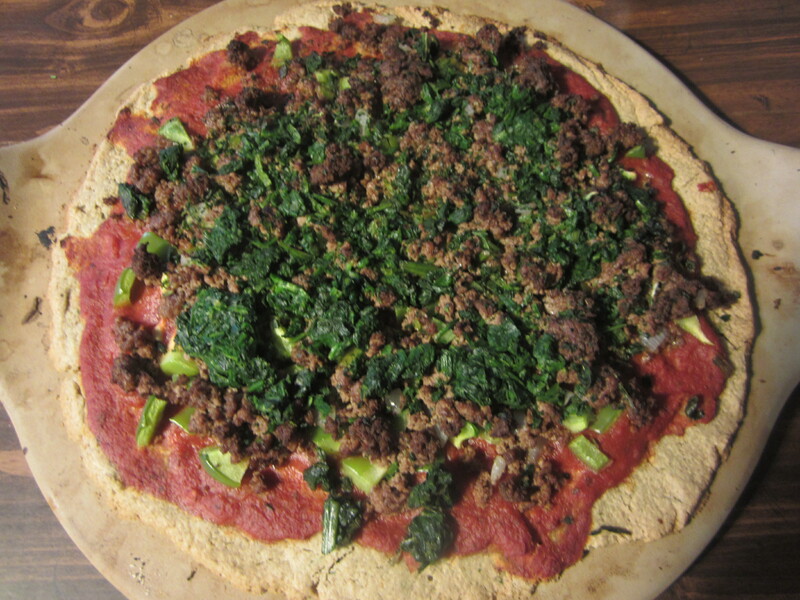 Gluten free pizza recipe – enjoy. Spices like oregano, parsley, garlic, pepper, salt, etc. Mix it all up let sit for a few minutes to let the oven preheat to 450. Dump on pizza pan cook for 30 minutes add then add toppings. I threw on some ground burger, peppers, onion, garlic, tomato sauce, and spinach. 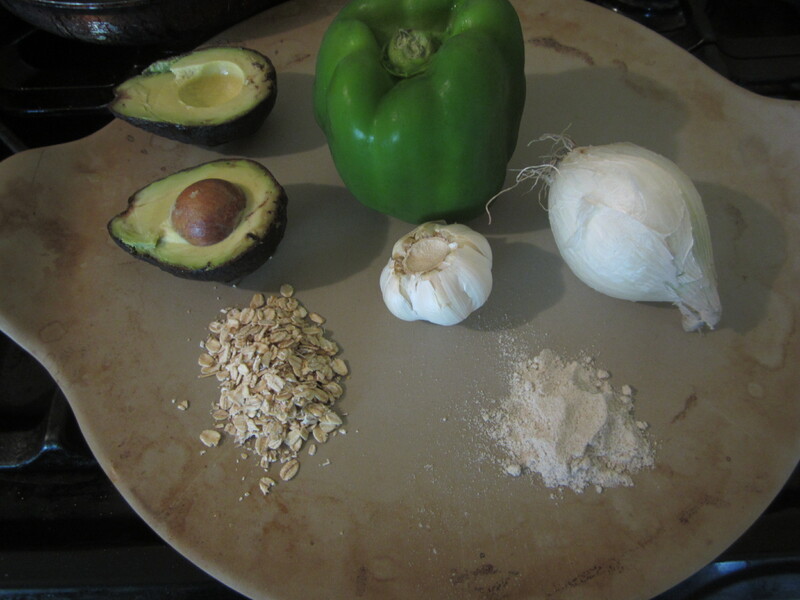 (I didn’t use the avocado you see to the side, I decided against it.) Cook for another 20 to 30 minutes. 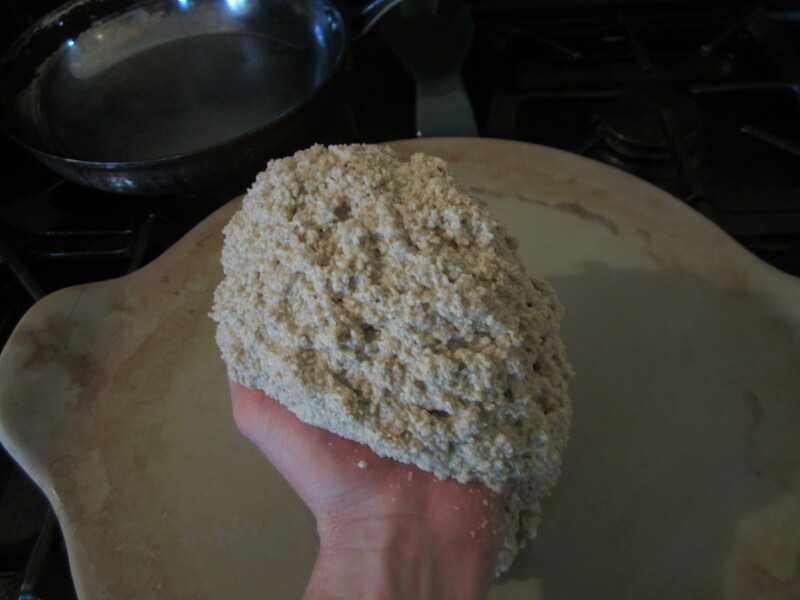 I used a stoneware pan which works very nicely for pizza. Beth held her dolly tight as her mother pulled her quickly along. She heard her father calling from the far side of the throng of people. Her mother clutched her hand tightly as she pushed forward through the crowd. Pain throbbed in Beth’s hand because of her mother’s death grip, but she held her tongue. As they fought to where her father was standing, the mill of legs was all that Beth could see. It was chaotic and panicked. She could tell that everyone was scared. Even Mother and Father, to see them so frightened scared Beth. They finally reached Father who pulled them in close. Her mother and father began whispering earnestly back and forth. Beth looked around. The crowd looked frantic – people running, families holding each other, mothers crying. “NO!” At the sound of Mother’s voice Beth turned and looked up at her, who looked down, her eyes brimming with tears. She pulled Beth’s head toward her waist and buried it into her long overcoat. All Beth could hear was the muted voices of her parents talking – she didn’t know what they were talking about. Or what everyone was so frightened of. It all happened so fast. Her father had come home from the factory early today and pulled Mother into the other room where they talked for a long time in hushed voices. When they came out they were carrying luggage. Beth’s mother had knelt down and helped her with her coat. As she buttoned it up she looked Beth in the eyes and told her that they were going to visit their auntie’s house in the country. It was going to be a holiday, she had said with a smile. Now Beth hugged onto her dolly wondering why everyone was so afraid. Mother took her hand again and they were pushing their way through the crowd, following Father. He pushed open a big thick wooded door and held it as they walked through. Beth heard the sound of a train whistle at the far end of the station. She smelled the smoke from the train’s engine as it blew through the open air. There was less of a crowd out here but everyone still looked frantic and moved with urgency. They got to the door of the passenger car and Mother knelt down in-front of her as she had earlier. Beth looked down at her coat – a single ticket hanging from a button hole. The train began to move, Beth called after them tears streaming down her face. She reached out with her hand crying out to them. Mother and Father held each other tight, Mother sobbing and tears brimming over Father’s eyes. They disappeared from sight as the train rounded a bend. Beth saw smoke rising from the city. This past week we had the chance to run through another play test of a new game I’m designing. 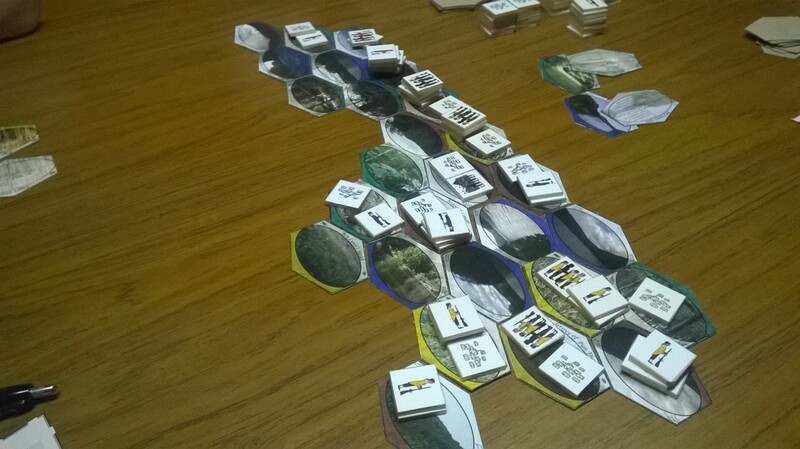 The working name is Frontier and it’s a game of exploration, expansion, and holding your own. You build the board as you go but it still gets very small very fast. Everyone is pushing to expand their own boarders while trying to hold on to the areas they already have claimed. The game has some elements of territory building, tile and unit placement, army building, and a little bit of bidding thrown in just for fun. A TIME NOT TO LONG AGO ON A TABLE TOP NOT TO FAR AWAY….. 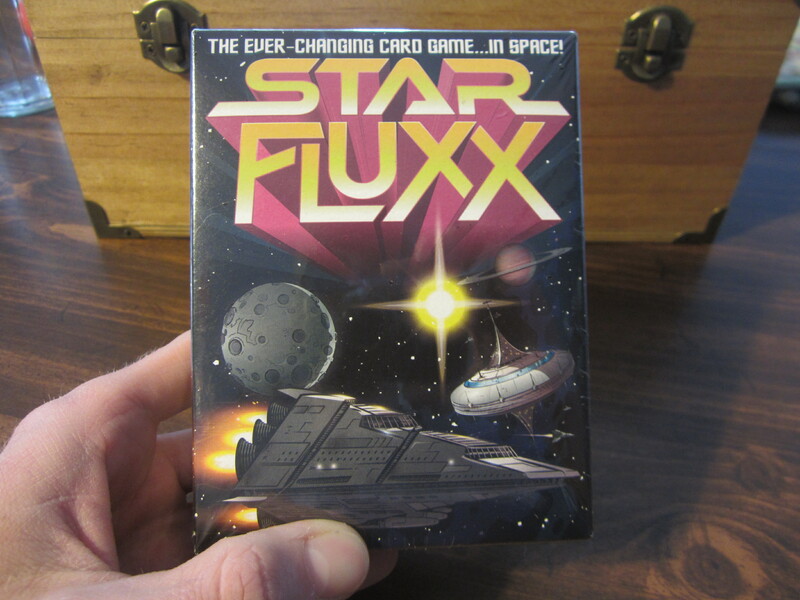 If you recall I picked up Star Fluxx during my latest outing and if you don’t you can read all about it here. —–> CLICK ME!!! It’s just that simple. Draw cards, play cards, win the game. 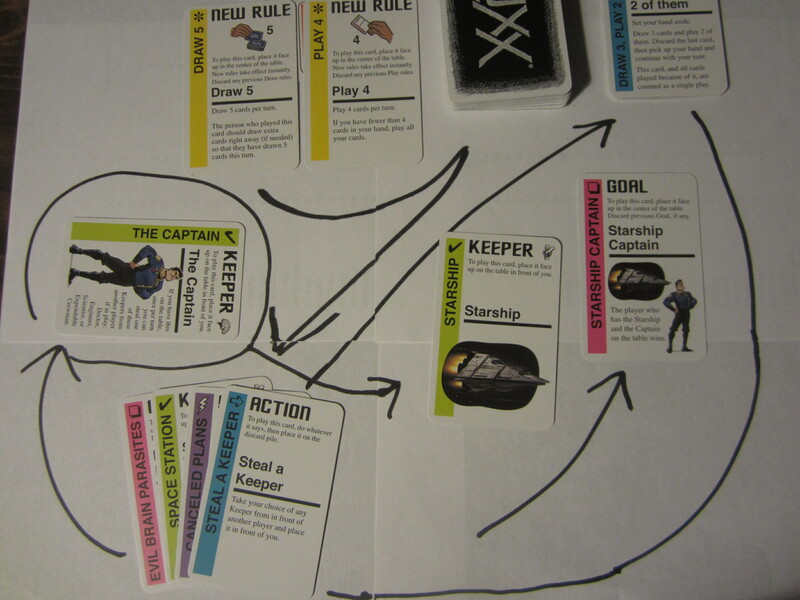 In the example set up here I played Steel a Keeper and stole The Captain, which allowed me to win the game because I had the Starship so I met the Goal. It was quite the stroke of luck that I just happened to have the Starship, don’t you think?? But even with all that planing Creepers can throw a monkey wrench into your plans. 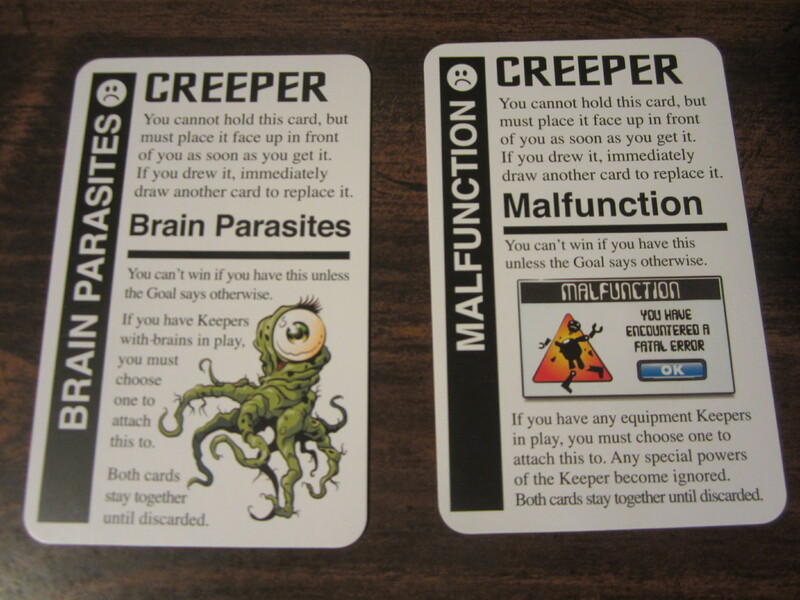 Creepers like Brain Parasites or Malfunction. 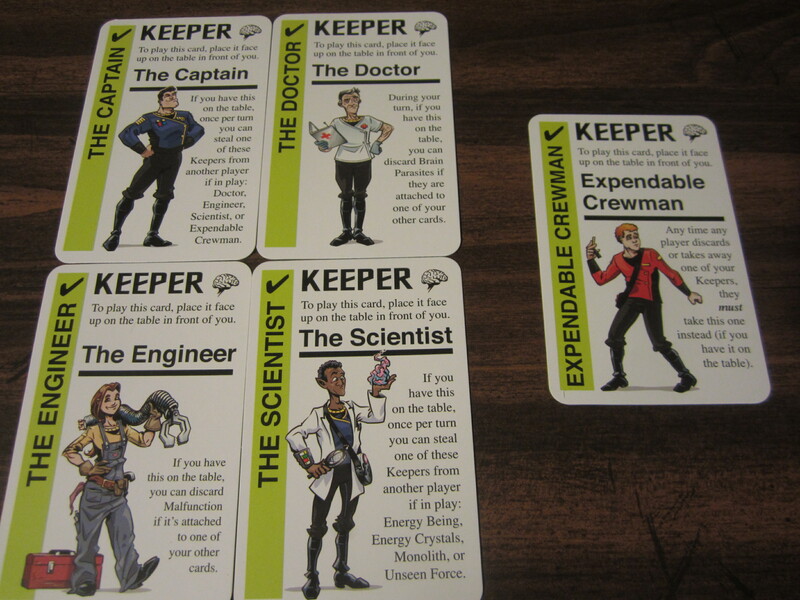 Which would easily attach themselves to your keepers (because that’s what they do in Star Fluxx) and keep you from winning. So, now we have a Captain with Brain Parasites flying a Malfunctioning Starship. That just won’t cut it. See the sad faces in the corner of the Creepers? So we need to find a way to get rid of the Creepers and fast. The easiest way to do that is to discard the Keeper it is attached to and away the Creeper goes too. The whole crew is waiting for you to pick up your copy today. Or not, whatever. I must say though it is a nice twist on the already fun game. Cards with new abilities, varied action cards, and strange new keepers like The Unseen Force. Which I don’t have a picture of because it’s unseen, duh. I thoroughly enjoyed the game and would pick it up again but I already have a copy and that would be silly. Pay no attention to the 2 copies of Carcassonne behind the door.